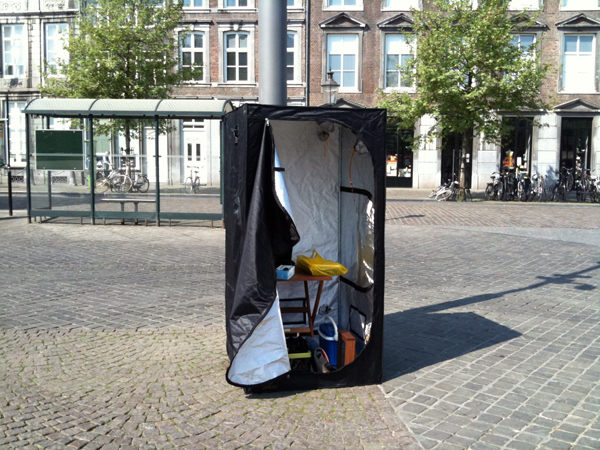 Hi - we are looking for such a tent to put in the basement so we can use the space as a darkroom without doing any construction. We have a lot of space and don't need it to be portable, so looking for the biggest tent we can find. Do you have details on the larger one you had been using? The larger tent is one I made by covering an expandable tent frame (search amazon 'canopy tent 12x12') that I borrowed with plastic sheeting from home depot, I think I used 3mil sheeting because it was cheapest, but I ended up having to use a second layer for the side of the tent that was in direct sun. In the basement you would not need two layers, though I would still turn off all lights in the basement while you're using the darkroom, especially if it's for silver process, the plastic sheeting may get pinholes over time and light may bleed though depending how close the artificial light sources are. The roof of the canopy tent frame is pretty tall so it may not work for the basement. A good way around this would be to do a tiny bit of construction and build the frame with 2x4's and cover it in black plastic sheeting. People also use light proof fabric which I would have preferred but is more expensive (amazon 'Blackout Roclon Fabric ,Three Pass Blackout Drapery Lining, 54" Wide'). I found a '120x120x78in/10x10x6.5ft Xlarge Non-toxic 600D Mylar Reflective Grow Tent Hydroponic Dark Room Box Hut' on amazon, but it's reflective-lined like all hydroponic grow tents so it's going to magnify all light inside. If you're in the basement and can make the room mostly light free then that shouldn't be as big of an issue, but if I were making a darkroom for silver process I wouldn't pay $400 for a reflective lined tent, I'd build a simple frame with 2x4's and cover with fabric or sheeting. The nicest thing about the hydroponic grow tents is the doors zip shut, however it sounds like you have the space in the basement and can just make a darkroom entrance with two 90 degree angles to block light and then you can avoid having to close the door at all. The space in the 12x12 tent was great for having ample room to work. Good luck with your darkroom! If you get it up post a link to photos if you put any up, I'd love to see what you figure out.